With more than 80 programs serving more than 160,000 Marylanders each year, Catholic Charities of Baltimore relies on the generosity of more than 8,000 volunteers who serve thousands of hours every year to help us fulfill our mission of improving the lives of Marylanders in need. We serve all those in need, regardless of their religious beliefs. 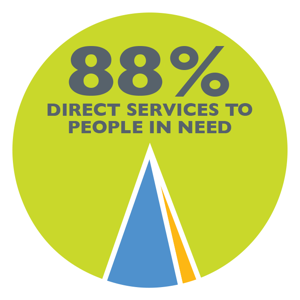 Our donors, volunteers, clients, and employees come from every walk of life, ethnic, and religious background. Volunteering with Catholic Charities is a fun, impactful way to contribute to your community. While volunteering, you also can build comradery with your team, teach your children the value of community service or meet others who want to make a change in the world. Catholic Charities has something for everyone! Serving people of all ages, we can help you find your place to make a difference. Q. Do I have to be Catholic to volunteer? A. No, we welcome volunteers of all faiths, ages and group sizes. Our volunteers reflect the diversity of our clients and the communities in which we serve. Q. Who do I contact for more information about volunteering? A. To further discuss volunteer opportunities with Catholic Charities, please contact Patricia Newman at 667-600-2024 or volunteer@cc-md.org. If you know which program you are interested in volunteering with, you may also contact the program’s volunteer coordinator found on the program’s page. Q. Am I required to fill out an application? A. Yes, you may be required to complete an on-line application as a first step or after discussing volunteer interests and opportunities with a program Volunteer Coordinator. If you are participating in a special one-time group volunteer activity (United Way, school or faith-based group, etc) an application may or may not be required. The Volunteer Manager will let you know. Q. Are there special requirements to volunteer with Catholic Charities? A. In some cases, in order to protect and provide the best service to our clients, some programs may require a background check before you will be assigned a volunteer position. Certain volunteer activities where you will be transporting clients or driving on behalf of Catholic Charities will require a driving record check. The program Volunteer Manager will discuss specific requirements with you before a volunteer position is assigned. If you are participating in a special one-time group volunteer activity (United Way, school or faith-based group, etc) you may be exempt from background check requirements. Moreover, privacy and other regulations may require that volunteers are of a certain age. Q. Is there flexibility with time commitment on certain projects? A. Each program and volunteer activity requires a different level of commitment. We will work with you to find a volunteer opportunity that can fit both your schedule and our program needs. Please discuss time commitments and flexibility with the Volunteer Manager of the program in which you wish to volunteer. Q. May men volunteer at programs specifically aimed at women and vice versa? A. For the most part, yes, men and women are welcome at all of our programs as volunteers. The Volunteer Manager will inform you of any policies they have specific to their site. Many of the programs need volunteers of all kinds. If you would like to learn more about their volunteer needs, please click the links below.